It's a good beginning to the day when a day breaks open like it did this morning. Either it comes through the trees in dark and light contrast, or it flows over the river fog in pastels not ever seen again in just the same way. Sitting on the deck watching two cats playing while all this is going on just adds to the overall "I feel good!" moment. And you have to smile. If a poll were taken to establish the mammal in Louisiana that most consistently gets bad press, it would probably be the nutria, aka the neutral rat. Introduced into Louisiana in 1938 by people on Avery Island for the purpose of farming them for their fur-bearing potential, the nutria has gained few friends to this day. When storms damaged their holding pens and liberated some of the rats into the surrounding marshes, away they went. With a high reproductive rate and a propensity to weather adversity, and few predators, it was easy for these animals to take advantage of the new home thoughtlessly provided them. The rest of this story is well known to anyone having roots here; there was an explosion of the population that peaked, I believe, around 1955. There were so many of them that certain roads in the Pecan Island vicinity would become dangerous because of the slickness of mashed nutria. Only vultures and crows and some other scavengers welcomed this as a good thing. Why no predators? Such as alligators? Remember there were almost no alligators at that time. I don’t know how endangered those reptiles really were, but they were definitely scarce. Nothing else here at that time could easily kill a full-grown nutria. Eagles? There weren’t any of those either, not to speak of anyway. So, they made a name for themselves as destroyers of the marshes and were blamed for a reduction in the muskrat harvest too. For a little while, trappers were able to benefit from initial prices for nutria skins, which were pretty high at the beginning. But after a little while the fur market declined generally, and the prices went down to very little, resulting in even the ultimate predator, us, becoming uninterested. Those huge populations of the 1950s have leveled at lower numbers, but you still notice that damage to levees is publicized, and declining marsh integrity is still attributed to the big rats. There are bounties for them now. Efforts to create a line of cuisine based on rat meat have not gained wide support, even with celebrity sponsors. Ironically, one of the current uses for nutria meat is to feed it to alligators being farmed for their skins. It’s almost as if we will show Mother Nature that if the gators won’t control the nutria in the wild, we’ll raise enough of the gators in farms so that we can harvest the rats to feed them. Something does seem kind of mixed up there. I have another suggestion, one that I have never heard mentioned in a serious conversation before. I propose that we develop the pet market for them. People already buy and maintain rats of the smaller variety, why not larger ones that you can really get personal with. How do I know that this will work? I know because two times in my life I have been privileged to keep company with domesticated neutral rats. However, liabilities being what they are, I have to say I WOULD NOT RECOMMEND ANYONE ELSE EVER DO THIS. If this sounds contrary to my theme here, oh well. The first time was in 1975. I was commercial fishing full time then, and living along Bayou Teche near Franklin in St. Mary Parish. A visiting friend said he had been in the marsh the day before and had come across some baby nutria. He didn’t want them and I agreed to try to raise them. Right now, I don’t know why I said that. There were two of them. What do you feed baby nutria? I didn’t even know if they were weaned, and now I doubt that they were. “Wild animal milk” or milk substitute like you see nowadays was out of the question, both from the standpoint of cost and availability. Knowing that nutria are vegetarians was the only clue, so the trials on various things that were thought to be easy to digest began. One of the little animals got weaker and didn’t make it. The other one seemed to hold his own for a while and then begin to get stronger. The key food was canned water chestnuts. No kidding. That is what he chose to eat, and he did well. As he grew stronger, other vegetable material was added to the acceptable list. And soon he ate pretty near everything. More on that. A potential problem from the beginning was the dog we had. He was ½ husky, ¼ German shepherd and ¼ wolf. I had owned quite few dogs by that time, and Cajun was the smartest I had ever seen. 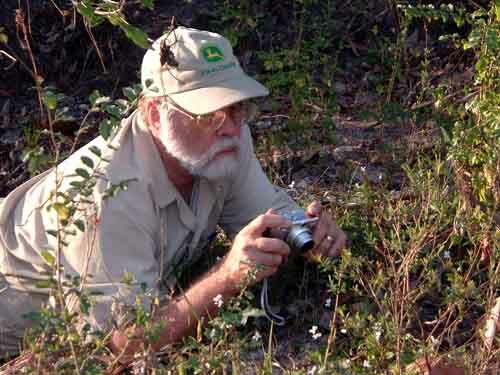 He was gentle around everything except aggressive dogs and small mammals of all kinds. He killed anything small that did not retreat fast enough. He didn’t do it with loud noise or even any bad temper, he just put a quick end to their lives (some he ate) and continued on his way. You didn’t want him around other people’s cats. Naturally you would expect the little nutria to fall into Cajun’s category of disposable items, he had killed many full-sized nutria before this. I said the dog was smart and by that I mean he seemed to understand the meaning of things you told him to do or not to do. You had to use a certain “command” tone I guess, but not much of that. 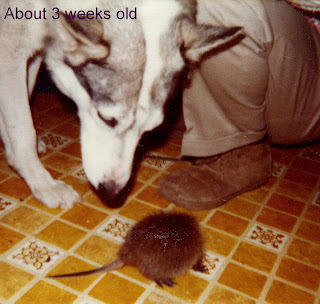 So, I took the little rat the same day we got him and put him under the dog’s nose, being careful to anticipate a quick move on his part, and said NO several times with a kind of threatening hand gesture. The dog smelled the rat and backed away. Whew. First test passed. And that proved to be all that was necessary, even to the point that the rat imprinted on the dog and from then on considered the dog his litter mate. Later on when the nutria reached sexual maturity, it considered the dog something to explore. Time after time you would see the rat making moves on the dog’s leg to the apparent embarrassment of the big dog. Sometimes he would roll his eyes and get up and move away, but he never threatened the rat. Anyway, with the live-in problem addressed, the rat continued to live with us, in the house at night, and outside in the daytime. 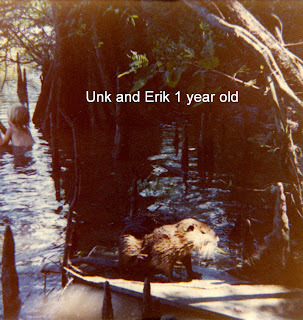 He grew and earned the name “Unk” when he was old enough to make nutria sounds. He really liked to play. If you were sitting on the floor, he would come up and grab your arm and throw himself sideways onto the floor. He seemed to like being tussled on his belly like dogs do, frequently making a moaning sound. At first it was hard not to be apprehensive about those four big yellow teeth flashing around, sometimes holding your hand between upper and lower incisors, but he never even scratched us. He seemed large, but as this species goes, he really wasn’t big. He eventually reached about 25 pounds. I like to say that this big rodent answered to his name, but I’m not sure if it was that, or it was just because his name sounded a little like the sound they naturally make. Why do I say he answered? Well, in the spring and fall I fished mainly in the daytime, so I was gone all day when Unk was outside. Most of the day he either spent down at the bayou (50 feet from the house) or curled up asleep on the front porch. Incidentally, if someone he didn’t know drove up and approached the porch, he would go into this hump-backed aggressive/defensive posture and he caused some people to stop in their tracks. 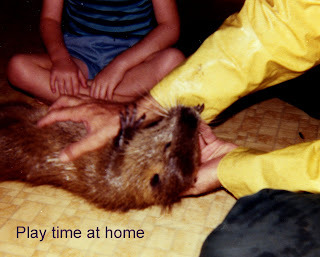 I do hesitate to propose attack training for nutria, really. Anyway, back to the name thing. I would come in during the late afternoon and if he wouldn’t be up on the porch I would go down to the bayou and onto a floating dock that extended out about 70 feet. Often you couldn’t see him anywhere. I would start to call him like you would a dog, using his name and come-here calls. After a moment somewhere up or down the bayou, you could hear him calling and you could see that “V” of his head pushing through the water at speed. On he came to the dock. When he was about 20 feet away from the dock, he would dive and disappear from sight. I would put my hand and arm down in the water and wait. Suddenly he would come up from below and grab my hand and arm in his teeth and front feet, moaning and tugging. I would hold onto him and thrash him around in the water and we would have a good time. That was fun! 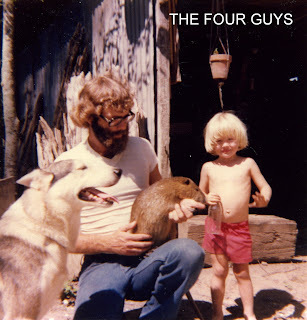 My son Erik thought it was the most natural thing to have a very large rat as a pet. 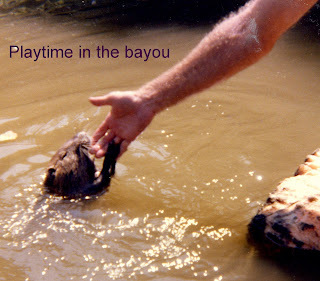 He played with him and they swam together in the bayou. One of the pictures here shows the two of them in the water. After some years it became time for us to leave Louisiana, and that made it necessary to find some way to pass along a domesticated nutria. Not an easy thing when you think about it. I believe you had to be close to some body of water for the animal to have access to some of its natural habits. We did, and we were lucky enough to find a game warden who also had a pet nutria that was treated more or less the same way Unk had been. It really was a rare thing to find. When we brought Unk to his new place we were concerned that he would be disoriented and frightened. Ha! The other animal was a female and the last I saw of the pair of them they were ducking under a bed and making very intense noises. The second time I shared a domicile with one of these rats was in 1985. This time it was a female and I acquired her the same way Unk had come ten years earlier. Eventually she grew to adulthood and had a litter of young in a den near the bayou. She brought the babies up to the house every day to eat out of the bowls of dry catfood left on the porch. The babies never did become friendly, possibly because they never associated humans with their very early life. The mother would join with the two cats and follow me around the yard on long walks around the perimeter of our property, causing neighbors to call and ask what that was that was following me around. After initial disbelief they had to believe me when they could see for themselves that what I said was true. One day this animal just failed to show up, possibly for any number of reasons. So, that’s that story. It is all true, I guarantee. The river is at 9.4 feet on the Butte La Rose gauge, falling to 7.2 by next weekend. The Mississippi and Ohio are both falling all the way up so there will be no real early sustained rise this year.